Miscanthus floridulus (Poaceae), a species of reed; the Māori reflex denotes the culm of the tussock grass, Chionochloa conspicua conspicua (Poaceae). and Proto-Polynesian *kaho "rafter; purlins"
to Proto Central Eastern Polynesian *kākaso "the reed Miscanthus floridulus". Clumps of Chionochloa conspicua conspicua - hunangaāmoa - showing the culms - kākaho. 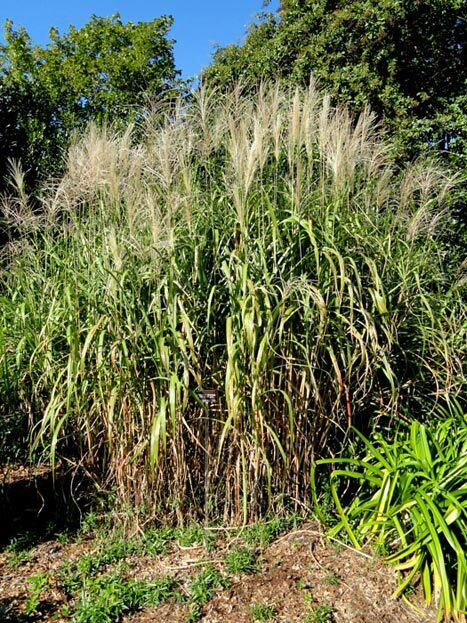 Clump of the "Pacific Island Silvergrass" or "Fernland reed" , Miscanthus floridulus - *Kākaso - growing in the J. C. Raulston Arboretum, Noth Carolina State University. Maori: Kaho "batten laid horizontally on the rafters to carry the several layers of thatch for the house". This is one of a number of words which historically are connected with uses and varieties of bamboo. There are accounts of these terms on the pages for *kofe and kohekohe. Watch this space! This page is still under construction, but it contains the essential linguistic and botanical information. More text and pictures will be added to progressively as soon as time permits. See the "News" for February 2016 for more information. This word may have been a reduplicated form of the word for bamboo poles used as rafters or purlins, from which the contemporary Māori word kaho is derived. The history of that word is outlined on section on contemporary Māori words which are reflexes of words relating to types and uses of bamboo, on the page for Kohekohe. 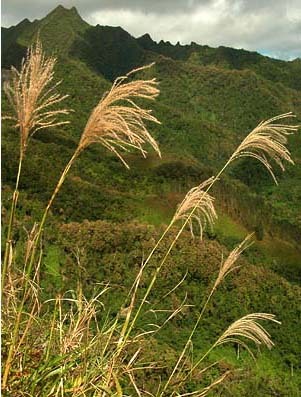 The kākaho (and the culms of the tropical Polynesian reed given cognate names) are reminiscent of the poles used for securing the thatch to roofs of traditional houses. 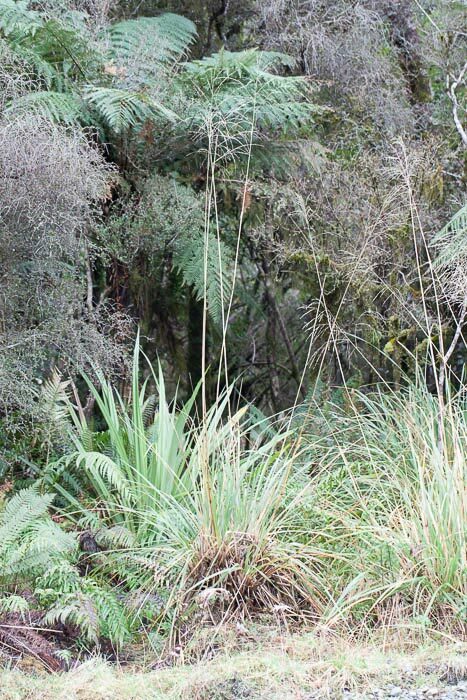 In Aotearoa the South Island tussock grass bearing the kākaho has the name hunangāmoho (hunanga-a-moho "the hiding place of the takahē -- the rare Notornis hochstetteri, and the extinct Notornis mantelli)". 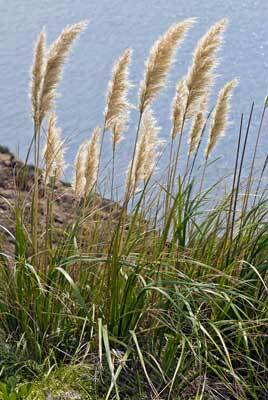 The others with culms referred to as kākaho are various species of the genus Austroderia, known collectively as toetoe. Austroderia splendens - Toetoe - showing the culms - kākaho - of the flowering stalk, Surville Cliffs, North Cape..
Further information : See Bibliography; also NZ Plant Conservation Network and the Cook Islands Biodiversity Database pages on Chionochloa conspicua conspicua and Miscanthus floridulusrespectively. Photographs: Top of page, Mike Thorsen, NZ Plant Conservation Network; J. C. Raulston Arboretum (North Carolina State University); Above, Jeremy Rolfe (NZPCN), Gerald McCormack, Cook Islands Natural Heritage Trust, Rarotonga.